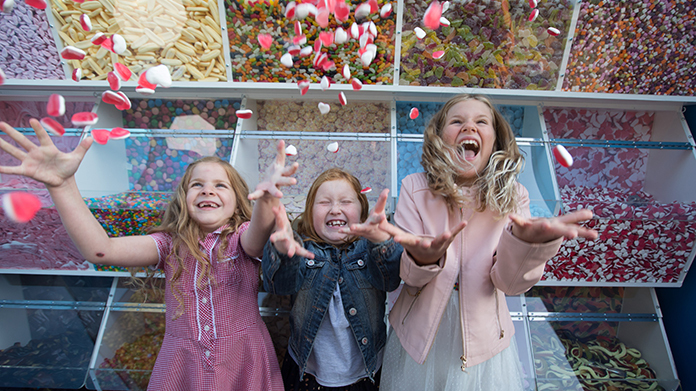 We’re partial to a sweet treat here in the land of Hope&Glory so we were pretty excited when we managed to find a way to be like kids in a sweet shop by creating a giant, five-metre high, pick ‘n’ mix on London’s South Bank recently. To celebrate the launch of O2’s custom plans, which gives customers complete flexibility over how they pay for their phone plan (the pick ‘n’ mix of phone tariffs if you like) we built O2’s very own custom plans pick ‘n’ mix, rewarding passers-by with their very own free bag of tasty treats. Featuring favourites from cola bottles, fizzy laces and jelly beans through to the slightly more divisive liquorice allsorts, 3,000 lucky Londoners fed their way through half a ton of sweet treats over two days. And it was a hit with media too! A nice piece in print with the Daily Telegraph, a lovely write up by the Mirror while The Guardian and Evening Standard both featured it in their ‘picture of the day’ gallery. It also caught the attention of the Hello! team who took time out of their day to pop down.